many there are in the jar. 2. Hat day: Charge church members who want to participate. Have all participants wear hats (serious or fun) to come to church one Sunday. 3. Band and choir concerts: Ask a band or choral group to donate their time by performing a benefit concert for your cause. Charge admission for the event. 4. Sleep-a-thon: On some winter weekends, there isn’t much to do but hibernate! Have students get sponsors to donate a certain amount for every hour they sleep and/or lie in bed for a whole weekend. 5. Bag groceries: Ask a local grocery store if you can bag people’s groceries for donations. Be certain to put up a sign saying what the money supports. 6. Skip-a-thon: Have participants gather donations or pledges using their pledge forms, then participate in an indoor jump-rope contest. 7. Auction: Have individuals, groups and businesses donate goods and services. Be creative in what you can auction off and make certain that the goods and services are sold at reasonable prices. 8. Perform a free service for donations: Rake leaves, shovel snow, take care of pets. When offering your service, ask the person who benefited from your actions for a donation toward your worthy cause. 9. Sell candy, cards, etc. : Work with reputable businesses that provide merchandise you can sell. Be sure at least half of the money raised goes to your cause. 10. Winter carnival or bazaar: Hold a winter carnival or bazaar. Invite students, staff, and the community. Charge admission and/or a small fee to play games. 11. Spelling Bee, Trivial Pursuit, Checkers, Scrabble, Twister: Have participants and spectators pay to participate and the winner receives a prize. Note: Poker is a no-no! Playing for money is against the law! 12. Sell buttons or t-shirts displaying local business logos. 13. Puppet Show: Make puppets with socks, felt and other craft materials. Pick out or write a story. Set a date, time, and location. Advertise with flyers and posters. Sell tickets in advance and at the door. Advertise to the local elementary school and day care facilities. 14. Spaghetti Dinner: Prepare a great dinner for church or community members and charge a fee. This goes over great on voting nights! 15. Hold a Theme Party: Decide on a fun theme. Charge an entrance fee, but be sure to explain to people what their cover charge is going towards. 16. Pledges: Gather pledges to have dance-a-thons, rock-a-thons, or any other type of endurance contest you can think of that can be done indoors. 17. Day of Community Service: Contact a number of organizations for which you would be interested in volunteering. Then have people sponsor you to do community service for 24 hours. 18. Food Fast: Get together with a group of friends, gather pledges, and fast for a full 24 hours. 19. Piñata Contest: After church one Sunday, charge a fee to have each blindfolded person take turns at trying to break a candy-filled piñata. 20. Craft Sale: Have your students make easy crafts and sell them. 21. Potluck Dinner: Host a pot luck dinner with games and activities. Charge an entry fee and have a raffle, Chinese auction, or 50/50. 22. Three-on-Three Basketball Tournament: Organize a basketball tournament in with the winning team receiving a prize. Charge admission and hold a bake sale to bolster sales. 23. Beat the Goalie: Pick the best hockey or soccer goalies in your church and invite people to try to score a goal for a prize. Every participant has to pay to play. 24. Bingo: Host a bingo night at a local hall, place of worship, or school. 25. Book (used book) Sale: Ask everyone you know to donate their old books—including the church, which is usually rife with used books. Hold a book sale after church. 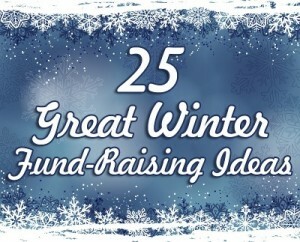 1 Reply to "Dead-of-Winter Service Projects 25 Charity Ideas for the Dead of Winter"